A few months back, I was on a Singapore website called; Gumtree. It's a site like e-bay, but instead of auctioning for an item, the seller puts a fixed price on an item(s) and if you want it, you contact the buyer. There are job offerings also, and advertisements for a variety of classes, but I mostly look for items to buy on it. As luck would have it, I stumbled upon a Derwent coloured pencil wooden box set. All 72 pencils in a beautiful wooden box, for $80. I managed to get the seller to bring the price down to $70, and the deal was made. Now, I'm a Prismacolor coloured pencil user. I've said that the quality of their pencils are dropping, and thus I am on the lookout for a new brand. When I first used the pencils, I thought they were really scratchy. I didn't like them, unfortunately. They were dry, and I had to use a lot of pressure to get good coverage. I thought that my dislike for them was probably due to the fact that I was so use to Prismacolor's waxy consistency, thus I set the pencils aside and gave it some time. A few weeks later, I buy new paper. Bristol board 160 gsm. It lays on better. Not as scratchy, but I'm still not sold on it. So I look for other Derwent products. Derwent's website is wonderful. Well designed, well laid out. I look through the products page and find the Coloursoft pencils. They seem interesting but I want to know whether the numbering system for the Studio's and Coloursoft is the same. So I write to Derwent using their Contact Us page. Quick, and easy. A representative for Derwent replies within a couple of hours. Her name's Vicky. She tells me that the numbering system are not the same and attaches the colour charts for both collections to her reply. I download both files. I've never looked at colour chart before, so there I am, sitting on my chair looking at a PDF file of the pencils wondering what all the numbers mean. I search online for a bit, and find out that the numbers represent lightfastness and they go from 1 to 8. 1 being, "you sucky pencil that'll screw my work over in a few months". And 8 being, "here's a gold star for you A-grade pencil. I commend you for being a hulk of a pencil". So I'm staring at my set of pencils with an upset face, because that's when I find out that Studio's are not lightfast. My heart shatters. I feel cheated. You.... Derwent... I trusted you and you betrayed me. But all is not lost! I sort the pencils out using the lightfast system. 1,2,3,4,5,6,7,8. There are lots of 4. With 1-3 and 5-8 being a similar amount. And being still upset, I look through the interweb for more information. I find out that some artist like Studio pencils for their hardness. They're good for drawing fur. Alright, I think to myself. I make a mental note to get around to drawing a portrait of one my cats. Then my mum comes into my room. "What's wrong, Dear?" she asks. My upset-ness must really show. "I feel so cheated," I reply. I explain to her what I've gathered. It takes some time for me to get that information into my brain. I finally ask myself; "How is the lightfast system really made?" To read about my journey to getting a better understanding in lightfastness; click here. But sticking to the topic, we already know that Derwent Studios are good for architectural drawings (as said on the Derwent website) fine details like fur, feathers, but what use did I find in them? I found out that they are PERFECT to lay onto canvases. No, really. Because you can maintain a very sharp tip on the pencil, they can fill the valleys of a canvas perfectly. I did a bottom layer to map out the main colours, then I burnished using a brush. A layer using Prismacolor, then another burnishing using a brush. And voila. Perfect coverage. 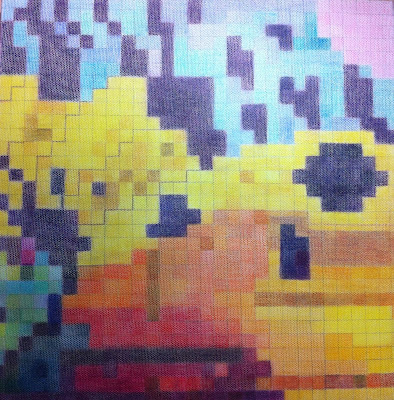 I blew up the picture of a butterfly's wing and drew that using squares. I liked how it turned out but felt it looked better turned 90 degrees to the left as seen in the picture below. It was a fun experimental piece and I already have ideas on projects to continue this series. I might try to draw more realistic subjects like flowers, or still life. Also, the white in the Derwent Studio has a lightfast rating of 8, so you can do good design work on black paper using it. It's not as white as the Prismacolor, but it really helps with the fine details. Thank you for the invite. I've gladly accepted your kind offer, and have already received the confirmation e-mail from S2T. I wish you the best of luck in reaching your aim of 5 million memories by Singapore's 50th birthday.